Building a culture of health, one block at a time. The Robert Wood Johnson Foundation asked us to create an environment at the 2014 TED conference in Vancouver that communicates “Building a Culture of Health” and provide a social space where people could escape the conference, get a coffee, meet new people, watch the conference simulcast, or simply check their email. It’s outsized building block design consciously used analog means to provide a counterpoint to the technology-heavy show. 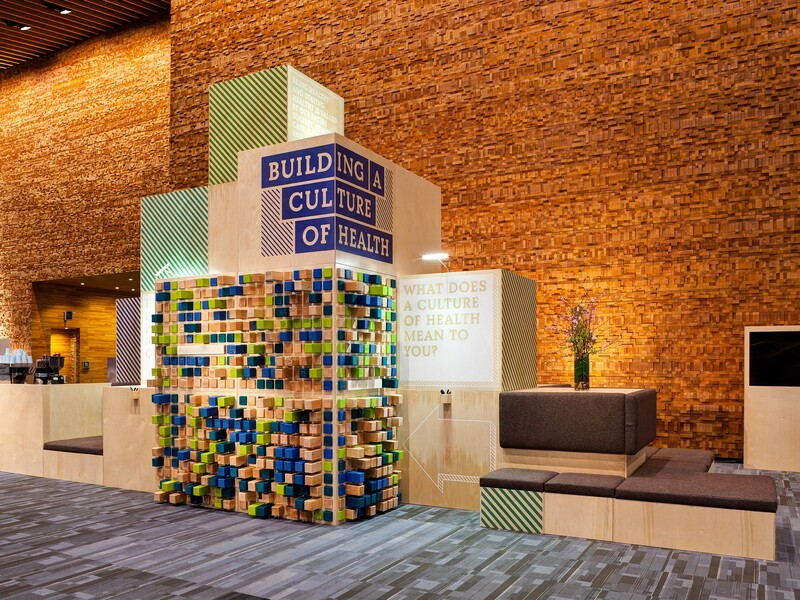 The centerpiece was a “suggestion wall” that asked visitors to contribute their own ideas by writing on a colored wooden cube and placing it in one of the gridded slots—literally “building” a culture of health. The design was also modular so it could travel to other locations (such as the 2014 Aspen Ideas Festival) and easily reconfigure to best fit into its new setting.